This PDF 1.3 document has been generated by Appligent StampPDF Batch 4.5.1 / Acrobat Distiller 8.1.0 (Windows), and has been sent on pdf-archive.com on 10/02/2011 at 04:13, from IP address 24.83.x.x. The current document download page has been viewed 1453 times. File size: 4.5 MB (5 pages). 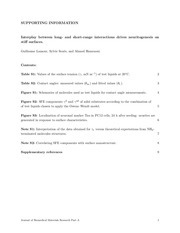 as surface energy (7) and wettability (8). solid surface is said to be hydrophobic. terms of cost and ease of construction. parts used to assemble the system are listed in Table 1.
r 2010 American Chemical Society and Division of Chemical Education, Inc.
tension of an ODS SAM. The dashed line in the inset box is equivalent to the line fit for all liquids. prevent drops being polluted by air contaminants such as dust. to provide the light source. two, marked by an arrow in Figure 1A. respiratory tract and may be harmful if swallowed or inhaled. groups, and thus, the contact angle for water is &gt;90° (Figure 1A,B). process images to determine contact angles. parts, such as camera, lens, and sample area. n-octane were fitted using the sphere approximation. to the “real” surface tension of the ODS substrate. γ (γ g γc) close to the critical surface tension γc of the solid. determined for the ODS SAM is γc = 19.8 ( 1.5 mN m-1. 20.7 mN m-1) (19) using the same method. applications, for instance in biomedical fields. Hamraoui, A. Colloids Surf., B 2009, 72, 208–218. 3. Fomenko, V.; Gusev, E. P.; Borguet, E. J. Appl. Phys. 2005, 97, 083711. 4. Seo, K.; Borguet, E. Langmuir 2006, 22, 1388–1391. 5. Moroseac, M.; Skala, T.; Veltruska, K.; Matolin, V.; Matolinova, I. 7-12, 2003; Surf. Sci. 2004, Vol. 566, pp 1118-1123. 6. Bodlaki, D.; Borguet, E. J. Appl. Phys. 2004, 95, 4675–4680. 8. Degennes, P. G. Rev. Mod. Phys. 1985, 57, 827–863. 9. Young, T. Philos. Trans. R. Soc. London 1805, 95, 65–87. Hicks, R. F. Langmuir 2009, 25, 2495–2500. 11. Nihonyanagi, S.; Eftekhari-Bafrooei, A.; Hines, J.; Borguet, E.
Health; http://rsbweb.nih.gov/ij/index.html (accessed Sep 2010). 14. Tillman, N.; Ulman, A.; Schildkraut, J. S.; Penner, T. L. J. Am. Chem. Soc. 1988, 110, 6136–6144. 16. Angst, D. L.; Simmons, G. W. Langmuir 1991, 7, 2236–2242. 17. Zisman, W. A. Adv. Chem. Ser. 1964, 43, 1–51. 18. Good, R. J.; Girifalco, L. A. J. Phys. Chem. 1960, 64, 561–565. Vijayamohanan, K. P. Mater. Lett. 2005, 59, 3890–3895. 20. Chow, T. S. J. Phys. : Condens. Matter 1998, 10, L445–L451. 21. Zografi, G.; Tam, S. S. J. Pharm. Sci. 1976, 65, 1145–1149. 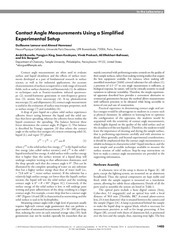 Step-by-step instructions on how to make a contact angle measurement. This material is available via the Internet at http://pubs.acs.org. This file has been shared by a user of PDF Archive. Document ID: 00028419.